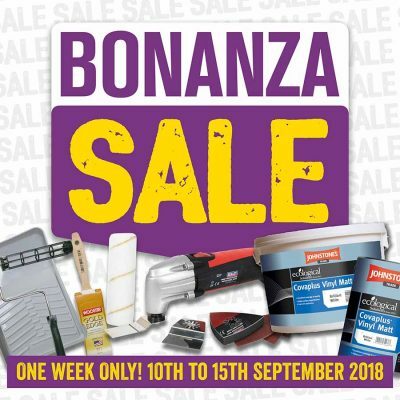 Johnstone’s Decorating Centre’s Bonanza Sale starts this Monday 10th September and runs for one week only. The sale starts includes deals on a range of products, including Cleanable Matt, trim products including Eggshell 5L Brilliant White, Aqua Water-Based Gloss Brilliant White and Aqua Water-Based Undercoat. There are also Bulk Buy bargains available on Covaplus Vinyl Matt, Vinyl Softsheen and Jonmat Premium Contract Matt. Special offers are also available on a range of other products, including Mirka sanders, Wooster brushes and rollers and Fat Hog products. The Bonanza sale will end on Saturday 15th September 2018.